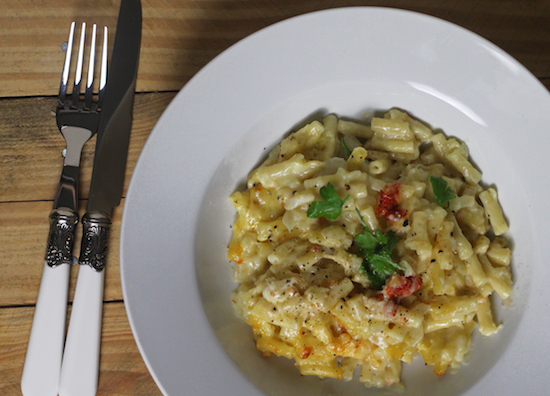 Emily's Recipes and Reviews | UK Food Blog | Leicestershire : lobster mac and cheese. A dreamy recipe perfect for seafood lovers, pasta obsessives and cheese fiends alike. And not just any old seafood either, we're getting fancy on the blog today with some Canadian lobster tails. Fancy food, but at rather average prices. You see, this month Iceland are celebrating their latest frozen ranges and their value for money, convenience, quality and choice. I've chosen to create a recipe which embraces the choice at Iceland which often leaves you thinking "I didn't expect to find that!" Their Luxury Uncooked Canadian Lobster Tails at £9.99 for 220g are a brilliant example of excellent quality too - they definitely don't taste like they've come from the frozen aisle. So I've put a luxurious twist on the usual mac 'n' cheese to create a rather posh macaroni cheese, with chunks of delicious lobster running throughout. Psst... I won't tell if you don't. Step one. Cook the lobster according to packet instructions, I chose to simmer for 8-9 minutes. When cooked through and cooled down, separate the meat from the shell and set aside in a bowl. (Keep the shell should you wish to use this as garnish). Step two. Boil the pasta according to packet instructions, which should take around 10-12 minutes. Drain and set aside. Preheat your oven to 180 degrees and have a large dish ready. Step three. Begin the cheese sauce by warming through the milk, onion and garlic. Step four. In another pan, make a roux by melting the butter then slowly adding the flour. It should form to a paste like consistency. Step five. Next, pour in the warm milk to the roux slowly, whilst stirring on a heat. It should eventually form together to create a creamy sauce. Lastly add in the cheese to make it an extra cheesy sauce! Season to taste. Step six. Combine the macaroni, cheese sauce and chunks of lobster before pouring into the over safe dish. Top with more cheese and black pepper as desired. Bake for 30-40 minutes until golden. Step seven. Sprinkle with fresh parsley and serve immediately! Have you ever made homemade macaroni cheese? Or your own cheese pasta sauce? You just can't beat it! Or how about seafood from frozen - would you put it to the test? Post in collaboration with Iceland. All words, recipe and photographs my own. Find out more at Iceland or over on the Twitter hashtag #PowerofFrozen. Ohhh that looks and sounds so good. I'm off to Iceland this morning and I'm going to pick up a Lobster tail. I went to Iceland yesterday and was surprised all over again at some of the frozen produce they have on offer and what good quality it is too. I think you have just invented my dream food! Just sounds so rich and moreish I am salivating. I love the Canadian lobster tails from Iceland - really good quality and reasonably priced too. 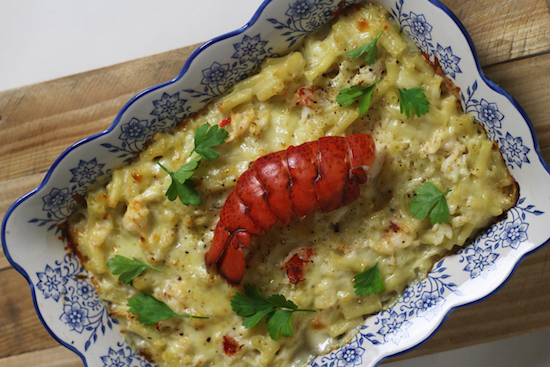 I love this idea of pimping up a mac n cheese with lobster. Icelands seafood is such good value and quality. I LOVE lobster Mac n Cheese :) Yours looks divine!